It’s graduation time for Amish eighth-graders. 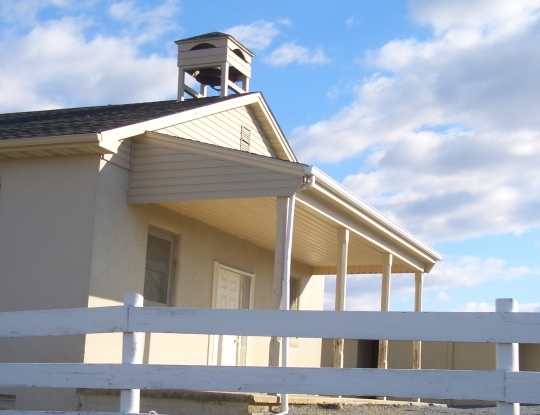 Lancaster Online shares a closer look at Amish and Old Order Mennonite schools in Lancaster County. Last year they published something similar, covered here. 1. Different ways to get to school – there are several common ways Amish children get to school. Based on distance and road safety, these include walking, riding a scooter, and traveling by pony cart. Some Amish children even ride the bus. Amish children in Allen County, Indiana are among those who commonly ride the bus to school. Holmes County, Ohio and communities in PA and NY also see Amish children riding the bus. 2. Multiple grades in one room – The typical one-room classroom will contain all eight grades, with about 25 to 35 scholars. The teacher calls one or two grades at a time to the front for their lessons. The other scholars work at their desks during this time. Some schools may be divided in two, with grades 1-4 in one room and 5-8 in another. 3. Each school has a school board – This is comprised of several fathers. They set pay and decide which teacher(s) to hire. Since Amish teachers are typically young women, and usually stop teaching when they get married, finding a new teacher can be a frequently-recurring task. 4. School ends sooner – Amish in Lancaster County have the same number of school days as public schools (180). Short breaks (only two days off for Christmas) and few snow days mean they finish earlier – mid-to-late May. By comparison, the public schools in Lancaster County have their final day about a month later, on June 15th. Amish kids also start a bit earlier, mid-to-late August vs. early September. Days off are nice, but an early start to summer may be nicer. 5. Graduation ceremony – this is an end-of-year picnic with family attending. Many schools hold events where parents and others might attend, notably the Christmas program. In the late 70s I attended a two room school in Nebraska for grades K-8. We had all grades in one room and would work while the teacher called up individual grades. The most we ever had was 24 students. We would have a Christmas and spring program where we put on plays and sang. The school board consisted of parents who hired the teacher(s) and did the budget. People are so surprised when I tell them about my K-8 years. Oh, and I had the same teacher for grades 1-8. Neat to hear that this was still happening in the 1970s Mrs. C, I was surprised as well. I am guessing you were in a quite rural area. Hi Tom – sure! I saw your message, wrote you back yesterday. Thanks for getting in touch! Our Lions Club donates dictionaries to 3rd graders in our area of the county (which borders Elkhart County), including the 4 Amish schools. I’ve seen a huge increase in the school population. Two of the schools are now two-room, with just a curtain between, and both sides are packed full. The 4th school was just built a couple years ago. I’ve not been in it yet, but it looks big enough for 3-4 classes, if needed. I haven’t seen that many kids there yet; maybe enough for 2 classes. Since I handed out about 20 dictionaries last year, that is a huge increase from the 2 or 3 3rd graders in each school just a few years ago. By the way, almost half the teachers I’ve met are men (that may change now that the RV manufacturing has picked up). As to transportation, I’ve never seen a scooter used by kids, nor have I seen a bus stop at Amish schools. The local kids here ride bikes, walk, or have pony carts. The Amish school calendar here is to start after Labor Day and end the first of May. If they have snow days, they make them up with extra days in May. One big change in the last few years is that most of the schools are locked during the day. I try to catch them during recess or lunch when the teachers and kids are outdoors. Barb being in Indiana you might find the Allen County Amish school setup interesting. There they have large multiple-classroom school buildings (see 2nd photo here: http://amishamerica.com/mystery-shack-explained/), bussing, and even a principal. Interesting that so many men are teaching in your area. That school in Allen County looks familiar. I must have driven by it at times. The newest one built here looks to be about half that size. So far the only Amish kids I’ve seen use school buses have been going to public schools. The farthest I’ve heard of children traveling to Amish school has been 8 miles, so it is probably faster with ponies. My bet for the mystery building is an ice house. Many Amish around here love to fish, and I often see them pulling a fishing boat behind the buggy on the way to a local lake. It reminds me of my grandpa’s ice house (which is the only time I ever went ice fishing). Yea if I’m not mistaken, I think they only have something like 3 or 4 schools for the entire community (of 22 churches)…it’s usually closer to a 1:1 ratio. You saw that old mystery shack post…that was a fun one. I don’t know if we ever figured it out conclusively but I think in the end I was betting on a building for children to shelter while waiting for the bus on snowy days, given its placement by the road. All of Amish are in eastern Allen County and for years, East Allen County Schools have provided busing for all private schools as well as their own schools. I grew up in Strasburg, Pa, (Lancaster County)and we had Amish kids ride our bus. They also attended special classes that were held at my school. I remember seeing deaf and mentally challenged Amish kids during the lunch hour. I work some in public education… an interesting trend is the creation of multi-grade (usually two) classrooms. We have, for example, several K-1 classrooms and this year have combined grades 5/6. While this creates some challenges, it also makes a lot of sense for a multitude of reasons. I chuckle when I hear educators announcing how they’ve discovered the successes that come from the approach. Guess they forgot the one-room school houses of yesteryear and don’t know how the Amish approach education! This is interesting Walter, just curious, what are the motivations for this trend? Erik: Regarding the “math trend” in public education, I think it’s part of an ongoing emphasis in STEM (Science, Technology, Engineering, Math) based on the belief (bias, maybe) that the future belongs to people with those skills: software engineers, programmers, robotics engineers, etc. We do this, in my opinion, at some sacrifice to the arts (not just drawing, language arts, etc.). Regarding penmanship, some public schools are no longer teaching cursive–and that’s based on that same belief/bias. Many talking heads suggest we won’t need pencils in the future. (It’s already possible–common, actually, in some venues to sign documents electronically. Lastly, I can’t resist commenting on male teachers–I substitute teach and specialize K through sixth grade. There are only two male teachers in our school teaching below eighth grade–one third and one fifth. We are rarities and even I am surprised at the fact the kids respond so well! Even the other teachers think it’s “cute” when they seem with a class of kinders. Walter thanks for the reply, this was interesting, especially on the male teachers. I actually was referring to the trend you mentioned of pairing 2 grades in one classroom, if you have any ideas. Frankly, part of the attraction to multi-grade is efficiency and cost reduction when class sizes get too small. If you have 30 kinders and 30 first graders you can do one kinder (20), one first grade (20) and one Kinder/First (20), eliminating one entire class and teacher. Placement of the students becomes important because the other attraction is that combining those who are struggling with stronger students often enables the strugglers to catch up. In other words, kinders who were “held back,” placed in a K-1 room often “catch up” with the other students so they all move to second grade. I’ve not seen data, but there’s some logic to it. It does create some teaching challenges, but the advanced students don’t seem to get slowed down, quite the opposite is true if the teacher facilitates properly. “The best way to learn something is to teach it,” has long been accepted as true, so involving the upper-grade kids in teaching the lower certainly has value. Somebody will probably write a book about it because it’s multi-dimensional, but those are a few considerations. This is done for one main reason…MONEY! I taught for 5 yeas in a split classroom. Another reason it is done is for a similar reason…too many student for one room and not enough for a second room. I attended a three room brick building school in a farming community in SW VA in the 60’s. Grades 1, 2 and 3 were in the same room taught by Mrs. Patrick. Fourth and fifth were taught by Mrs. Neal and 6 and 7 by Mrs. Hilt. Five students were in my class. Junior, Merle, Gail, Arlene and myself (Jerry) made up the class. Junior and Arlene were first cousins and Merle and Gail were double first cousins. All five of us sat at the same table. Older students (sixth and seventh graders) would help with lessons. It was all we knew. Since most of readers know, I’m an Amish Auction junkie and often visit Amish folks weekly during the season. I have made a couple of interesting observations. Many Amish are not that great with math. If I attend an auction food stand or a roadside produce stand I’ve noticed that math skills vary widely. Many Amish use solar/battery calculators to make change for purchases. Seldom do they use paper and pen to arrive at my total costs for food items. Some have difficulty even with the calculators to make change but they all know how many stitches per inch are on a quilt or how long a wooden board might measure. The men I’ve met are also very well versed on distance such as how many yards a target deer might be standing. They know enough to survive which is often more than many current public school students might know. Fractions are usually no problem and they know all about a “foot” and a “yard”. Interesting. One thing I learned from Karen Johnson-Weiner’s book Train Up a Child is that the type of education and curriculum can vary widely across Amish schools. “Practical knowledge” is a general guiding idea but what the Amish consider practical and useful can differ. Seems like basic math for home business calculations would be practical in just about every community. Someone recently made an interesting distinction between arithmetic (useful on a daily basis) and math (things like figuring out polynomials). Given the math emphasis in public education, it comes as no surprise to me that many end up with math anxiety. At least Amish know how to use calculators. I have been in fast food stores where the cashier didn’t know which picture to push on the cash register. Walter I would add a similar comment regarding arithmetic skills as to the one below on penmanship. I feel I’m not as sharp doing arithmetic in my head as say 15-20 years ago. Probably due to the whole outsourcing of certain brain functions to electronic devices phenomenon. Good point on difference between math and arithmetic. In the article from Lancaster Online it stated that one subject Amish/OOM schools teach is penmanship. That is good to know. I went to public grade school in the 1960’s and good penmanship was taught, including the need for everyone’s handwriting to be legible — which we were told would help us later in life. Also, I’m wondering if in some areas there are more male teachers in Amish schools than in the Lancaster area. Sometimes I feel like I need a “penmanship rehab” program 😀 My penmanship was never that great even as a student, but it seems like in recent years it has worsened. Not sure if that reflects the fact that I do the physical act of writing less – with most writing taking place using a keyboard now – or maybe just a lack of patience with the speed of physical writing vs. typing. Or something else. Interesting question on male teachers, I don’t have much I can add other than the anecdotal observation that I recall meeting more male teachers in Midwestern communities than in Lancaster. If it’s the case that they’re more common outside Lancaster, I wonder if this could be for cultural or economic reasons (might be easier to get by on a male teacher’s salary in a less expensive settlement). There are definitely more male teachers in Midwestern Amish schools. Improved pay accounts for that in some ways, but also the big cultural difference between the PA Amish and those of Ohio-Indiana background.